Did you know that white paint is one of the hardest colors to paint with? It’s absolutely gorgeous, it goes with everything, it’s fresh, it’s clean and it can make any piece of furniture look Ahh-may-zing! I’m definitely a huge fan of white paint, but there are a lot of potential problems that can arise when working with it. I’m on the tail end of finishing three custom pieces for a super sweet client, and they were all done in Snow White, which is the brightest white in the General Finishes collection. Here’s how it compares with Antique White, which is another beautiful white in the line. There are other lovely neutrals in the GF line, and they get progressively easier to paint with as you move towards the cream/yellow/beige family. From left to right, it goes Snow White, Antique White, Linen, and Millstone. 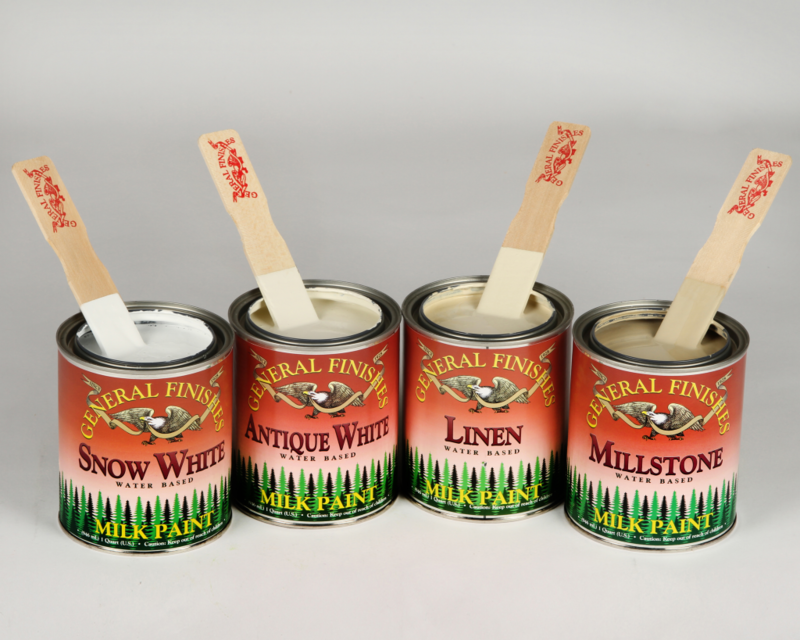 Now that you’re a bit more familiar with the neutrals in the GF collection, let’s talk about some of the issues that may arise when you’re painting with the brighter whites. This is the most common issue you’ll encounter when you’re working with any shade of white. Bleed through is staining that comes through your paint and rises to the surface. It can happen immediately upon application, days later or even months after your paint has cured. The stains can range in color from brown to yellow to pink and even red. Those stains can come from the original stain/dye that’s on your piece, the topcoat that was used to seal your piece, or even contaminants that are on the surface. They can even come from the wood your piece is made of too! This is why it’s so difficult to paint pieces that have a really dark reddish or orange finish in white. You will *almost* always get bleed through if you don’t take some precautionary steps first. 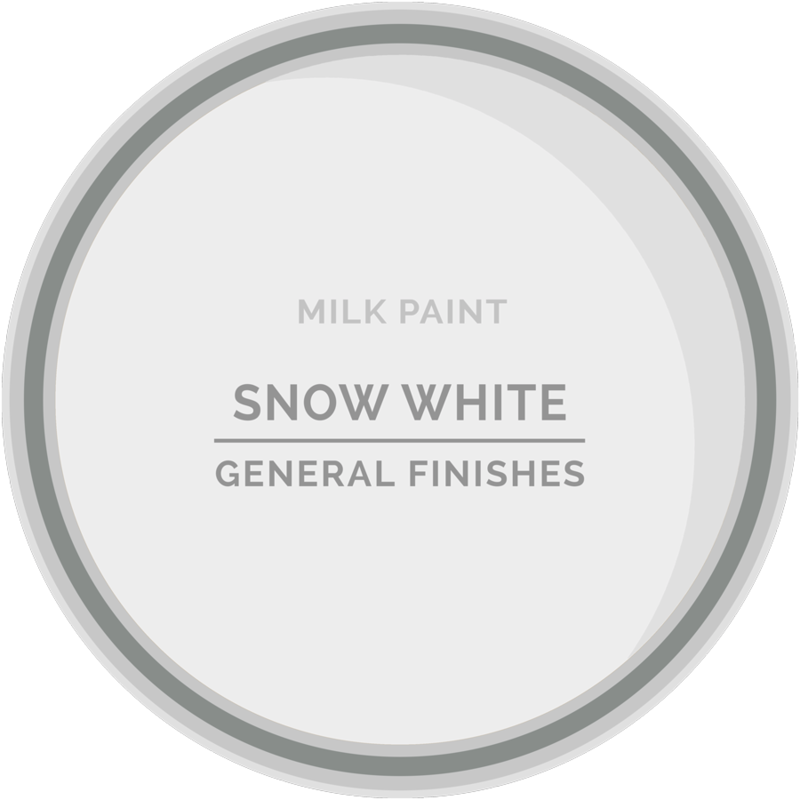 The best solution that I can offer that has the most consistent results is to use a white primer such as General Finishes Stain Blocker, Bin, or Zinsser. Some folks like using a product called shellac, but I personally do not care for it. Shellac has a very strong odor, and for someone who paints inside, this is a big negative. There are so many other non-smelly options on the market nowadays (including GF’s Stain Blocker) that it seems pointless for me to expose myself to fumes. Second, it’s difficult to see where you’ve applied shellac on your surface, especially if it is not painted already and it’s just a wood stain. Because shellac goes on clear, it’s tough to see where you’ve already been. Finally, shellac has failed on me on several projects…even with me following the instructions on the can. So I’d rather go with a product that gives me consistent results. 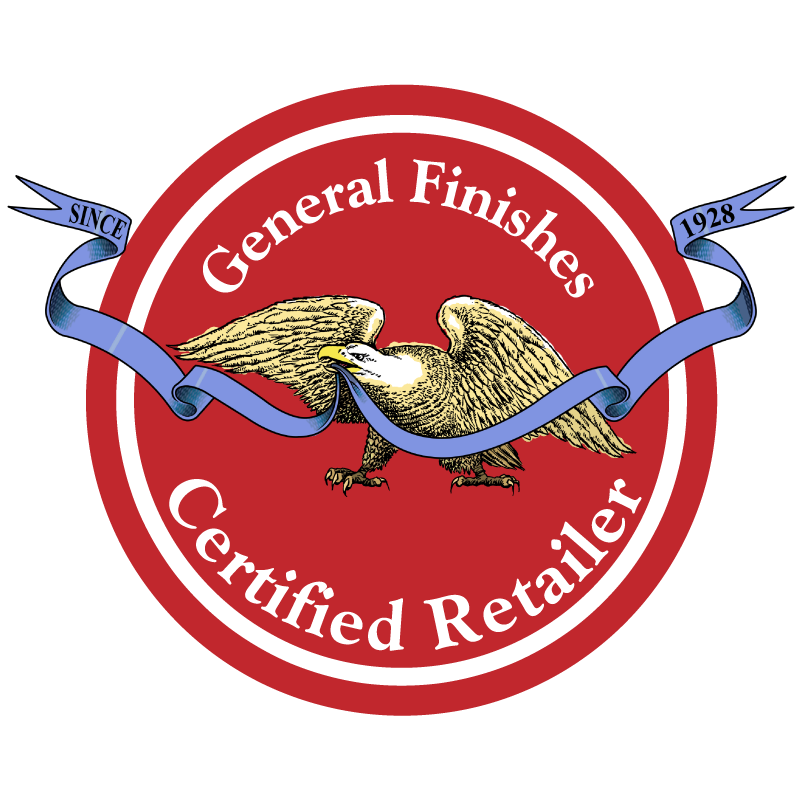 Now to be transparent, I am a retailer of General Finishes products, so I do have a vested interest in selling their line, however they do not put limitations and restrictions on what products their retailers can choose to carry. I’m not forced to put anything on my shelves that I don’t like and love, and Stain Blocker has found its way onto my display unit for good reason. 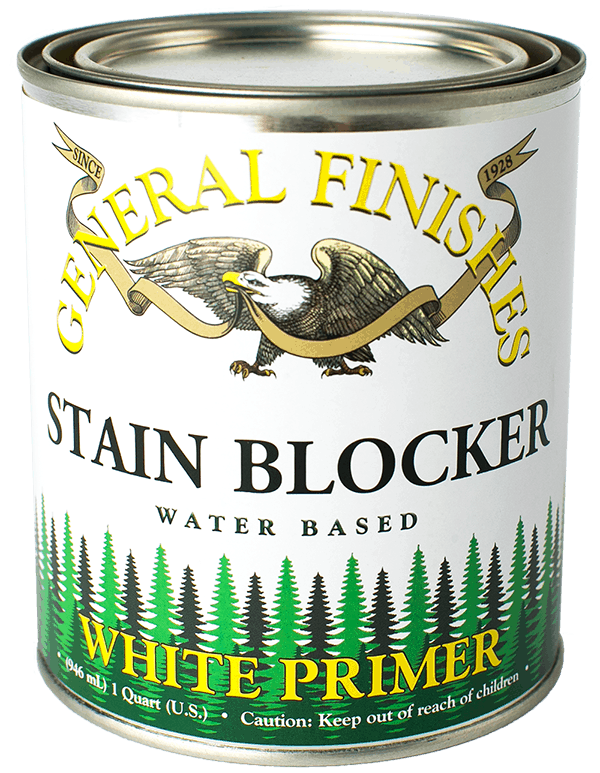 Because painting furniture white has become so popular, but it often leads to bleed through, General Finishes created Stain Blocker to help with the problem. The trick to primer is patience and applying two coats. The first coat of primer draws out stains on your piece. So when you paint it on and you see them coming through, that means your primer is actually working! Don’t panic – it’s a good thing! The second coat of primer seals all of the stains the first one drew out. Primer also needs 24 hours to completely cure, despite what the label may say. Reapplying over primer that has not cured yet may cause it to fail, which will lead to bleed through. So be patient young grasshopper. Trust me on this one! Oak, Pine, Mahogany, and Doug Fir are all woods that are prone to bleeding. So those pre-finished pieces that are made from pine fall in this category. So do those beautiful depression era pieces from the 30’s and 40’s along with those drop dead gorgeous mahogany federal style pieces. If you want to paint them in white, get ready to prime. Over time, all bright white paint will yellow – with or without a topcoat. It’s just how things are and there’s no way of changing it or preventing it. It comes with the territory of using white paint. I’m sure you’ve noticed this in your own home on your trim work. Even it’s only a slight amount, white paint that is fresh will always be brighter than paint that’s been applied a few months to years prior because it yellows (or ambers) over time. The reason why bright white paint yellows is because it has a lower “hide” quality and it’s more transparent. There’s hardly any pigment in bright white paint, so due to the lack of color, there’s nothing really in the paint to cover and hide stains. Contrast that with primer. Those are specifically designed to hide stains. White paint is not. There’s no real trick to predicting when yellowing will occur either, because there are so many factors that can cause it to happen. First, every wooden piece of furniture is different, even if it came from the same manufacturer, because they’re all made from different pieces of wood. There will be variations in pieces of wood that are the same species and even from the same tree! Wood can bleed tannins (or oils) immediately after you’ve applied your topcoat and you’re all done with your makeover, or it can happen years down the road. Plus, we rarely know what kind of finish is on our furniture, so all of those factors play with one another and can cause yellowing. Now I’m honestly not trying to be a Debbie Downer here. Remember that we’re discussing the issues that arise when you want to paint these types of pieces in WHITE. The very simple solution to these issues so far is to choose another paint color. You have to come to terms with the fact that not every piece will lend itself to being painted white. And if that’s the case with a piece you had your heart set on, you need to be okay with a backup plan. Black and navy are classy colors too! So do I have any tips for preventing yellowing? You bet I do! 1. Try to use a softer, more yellow white like Antique White or Linen. 2. Tint your topcoat! 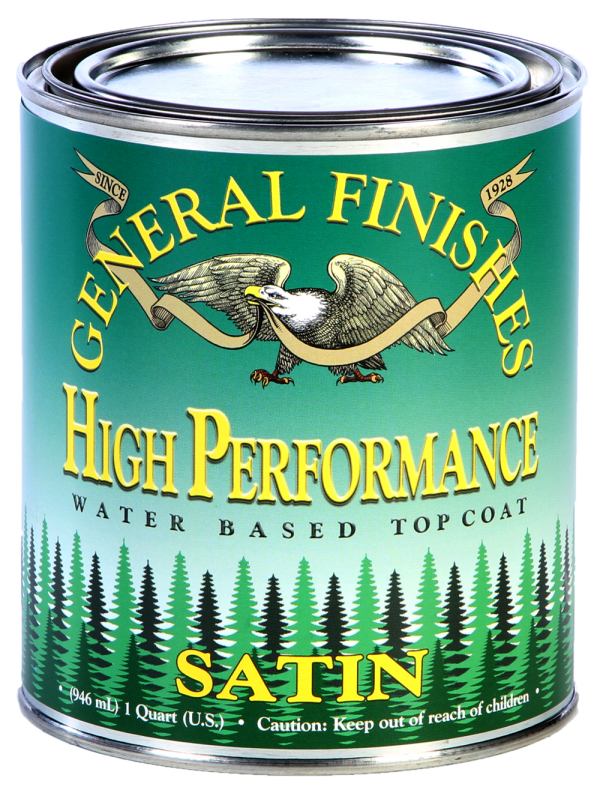 Add 10-15% of the paint you are using in your first application of your High Performance Topcoat. The last two layers of your topcoat shouldn’t have any paint in them at all. 3. Try not to mix product lines when working with white paint. This is especially true when working with a porous paint, such as those that are chalk based. The more porous the paint, the more likely that yellowing will occur. The problem is that the topcoat is actually seeping through the spaces caused by the larger particles of filler that give chalk style paints their texture. So try to stick with General Finishes line of products and don’t mix and match. Whenever you paint with white, get ready for multiple coats of paint. There’s really no way of getting around it. Like I mentioned earlier, white doesn’t cover very well because it has a low “hide” quality to it, so you’re more than likely going to need more than 2 coats of product. To help eliminate multiple coats, try using a coat of light gray over a primer before applying white paint. The gray provides a base that will literally play with the light and make your white paint look like it’s covering better than if it didn’t have gray underneath. True story! I hope that these tips and suggestions will help you with your next white painted piece of furniture. Taking the extra time to implement these steps to prevent bleed through, yellowing, and extra coats of paint will help you create a gorgeous bright white piece that will maintain its beautiful finish for years to come! If you’re local to the Morgantown area, you can shop for General Finishes products in my booth at Morgantown Market.